Parallax: noun: the difference in perception of an event by two observers caused by the difference in their orbit around the event. The purpose of this page is to provide quick access to events between 1976 and 2012 that either accidentally or through premeditation have shifted or will shift Human consciousness from one context to another - in spite of the prevailing paradigm. 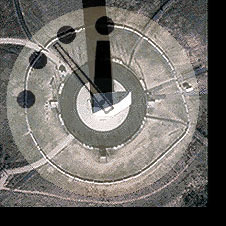 Though some will argue that this sequence could be extended back to the APOLLO 11 Mission, JFK's assassination, Sputnik, or the strange sightings of July, 1947 - the Face on Mars and the end of the Mayan Calendar, are modern milestones set in stone that bracket the undeniable events that will change the lives of everyone on the planet. The goal of this site is to explore not only how these events may have come about, but what we might do together besides ignoring them. That may be the shift that needs to happen most of all. Clicking on any icon will take you further into the SHIFT HAPPENS site; to pages where you will have the opportunity to add to the discussion and experience the shift yourself by binking on the SUPPORT THE SHIFT link to the SHIFT HAPPENS FREE STORE at the bottom of most pages. SHIFT HAPPENS: update icons will be added below the COMMENTS? link as actual events confirm the relevance of the page on which they are found. "Figuring things out for yourself is the only real freedom anyone really has." 1976. Scientists, reporters, and guests celebrating at JPL forget to exhale as the Viking orbiter photographs the Unexpected staring back at them from another world. Maybe the Strategic Defense Initiative broke the Soviet piggy bank or maybe it was just the thirst of Russian youth for the Beatles, Levi's, and all things Western that finally allowed Berliners to party on the wall that their friends and loved ones had been shot for climbing. Reagan's legacy is a new Russian hyper-sonic, MIRV Cruise Missile designed to defeat Star Wars, while McCartney has played Red Square and Roger Waters performed The Wall where the Iron Curtain once stood. The threat of Man's surrender to his own technology finally became a reality in 1999. For the first few hours of the year 2000, no one was completely sure of the future. Though not a stated goal until after the re-election of George W. Bush in 2004, descendants of the Third Reich and those who helped them; in control of the White House and Congress, are intent on creating a one-party system to keep dissent and the objections of the Minority in the minority... permanently. George W. Bush's first foreign policy act as President is to back out of the Anti-Ballistic Missile Treaty after boasting of "skipping a generation of weaponry". Someone demolished the World Trade Center. Something hit the Pentagon and somehow, a commercial airliner was forced into the fields of Pennsylvania; all during a massive exercise conducted to prepare for those very events. Who will take the Mark? What will be done with those who refuse? Regime Change and Pre-emptive War come to the two countries bordering Iran. The United States is killing thousands of Iraqi civilians. REPEATING; THE UNITED STATES IS KILLING THOUSANDS OF IRAQI CIVILIANS. Another decision that may doom us all. Preventative Detention and loyalty Oaths are the response to "NOT IN OUR NAME!" Who is the 20th hijacker? Since September 12th, 2001, it has been Zacarias Moussaoui; the only person to be charged in connection with 911. On June 12th it was a detainee at Camp X-Ray. Overnight, the most hated man in America, who had plead guilty to undisclosed charges finally brought against him - a plea that guaranteed that there would be no trial or any further questioning - was no longer the 20th hijacker. Neuropoly - not just a game, but the war for Men's minds spoken of by the Bible. Who speaks for the Planet? Eight Leaders or the millions they represent? We'll see a year from now. Almost thirty years since the Viking Missions, NASA is faced once again with just how wrong prevailing scientific wisdom can be as Comet Tempel 1 turns out to be a fragment of a shattered world instead of a "dirty snowball". "Down & Out In Beverly Hills" warned us about China. CNN uses the term "Peak Oil" for the first time on May 29th 2005 and seven days later "Oil Storm" premieres on the FX Channel. How many warnings are necessary? What will it take to pry the Truth from those tasked with Secrecy, and will we understand the difference when we see IT? No one can doubt that proof of the Extra-Terrestrial presence will change the World as we know it. Coronal Mass Ejection, Asteroid strike, global 10.4 earthquake or 500 mph Tsunami. If life has been wiped from the face of the Earth before, what must we do if there's a chance it might happen again? CANCEL OUR SUBSCRIPTION TO THE RESURRECTION. Whatever else can be said about the Interesting Times between 666 and 999, we're definitely in "OR ELSE". Did the Authors of the Popol Vuh just get bored with keeping track of time? Will 2012 be an even larger non-event than Y2K? Is December 21st 2012 the end of everything or merely when something starts all over again?? Perhaps passage through the Photon Belt or the alignment of our ecliptic with the Galactic Plane will bring an end to the Unexpected once and for all.